WASHINGTON — It ended with a whimper rather than a loud bang, which is probably a good thing. Troubled NBA Wizards star Gilbert Arenas pleaded guilty Friday in D.C. Superior Court to a felony count of carrying a pistol without a license. Sentencing is set for March 6. And though he could face six to 24 months in jail, he’s likely to get probation. Arenas has been suspended indefinitely from the team he had been expected to help improve this year. 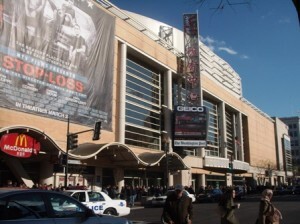 Authorities say Arenas brought four guns to the Verizon Center in December. On Dec. 21, he placed the firearms on the chair of a teammate he’d been beefing with, along with a note — that was supposedly in jest — that said “Pick 1”. Posted: 1/15/10 at 3:42 PM under News Story.